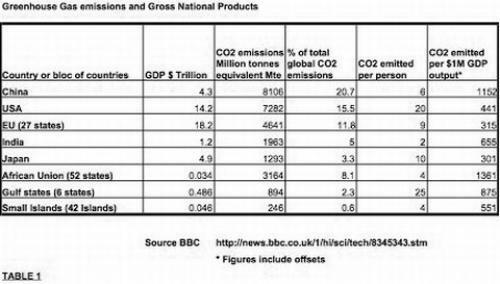 Newly-industrialising states claim that the figures which should be considered are the CO2 emissions per head of population rather than the total. The US, for example, produces 20 tonnes per person while China produces only 6, (see Table 1 below). Alternatively, they argue, if total figures are considered the historical emissions which are still largely present in the atmosphere, should be taken into account. According to figures published in the “New Scientist” 500 billion tonnes of CO2 equivalent have been produced by man since the industrial revolution. Deforestation accounts for 200 billion, and, of the remaining 300 billion 91.2 bn and 81.7bn have been produced by the US and Europe respectively. China and India’s contributions are only 27.8bn and 8.3 bn respectively. There is therefore serious cause for disagreement over this issue. However, despite all the arguments put forward, the real reason the Bush administration did not sign up to Kyoto was that the treaty would have limited the profitability of large sections of US capitalism, most significantly the oil companies. Similarly the real reason why China and India reject caps on their emissions are that such caps would limit growth and hence reduce profitability of most of their economies. The fact that world leaders have such difficulties in agreeing a new treaty illustrates something more fundamental than the failure of the so-called “democratic system” as suggested by Connie Hedegaard. It illustrates the inability of the global capitalist system, as a whole, to deal with a crisis such as this, when the solution would affect its profits. Even when environmental catastrophe is staring it in the face, the key issue for capitalists remains profit. Only when it is absolutely clear that the profitability of capitalism is threatened by greenhouse emissions will effective action be agreed. Obviously large sections of the capitalist class are convinced that this point has already been reached, which is why conferences such as Copenhagen are being held in the first place, and why the issue has become the stuff of mainstream bourgeois politics. The scientific basis for the proposed new treaty comes from the Intergovernmental Panel on Climate Change (IPCC). This panel was established in 1989 by World Meteorological Association (WMA) and the United Nations Environmental Programme (UNEP) to try and give governments a clear view of what was happening to the world climate. It has so far produced 4 assessment reports. The second provided the scientific background to the Kyoto Protocol and the fourth provides the scientific background to the present conference in Copenhagen (2). The IPCC concludes that greenhouse gases, notably, water vapour (3), carbon dioxide (CO2), methane (CH4), nitrous oxide (N2O) and various minor gases interrupt and reflect back the long wave emissions, i.e. infra red emissions, from the earth’s surface. The main constituents of air, nitrogen and oxygen do not do this. The result of this reflecting back of infra red emissions is that the mechanism the earth uses to get rid of some of the energy received from the sun is interrupted. Energy then becomes trapped in the earth’s crust and the atmosphere. The net result is an increase in temperature of the earth. Climate change is therefore anthropogenic or caused by human activity producing Greenhouse Gases (GHGs). The principal concern at present is that once a certain increase in concentration of GHGs in the atmosphere is reached, namely 450 parts per million, and once a certain temperature increase is produced, namely 2oC above pre-industrial temperatures in the 18th century, the warming process will be self sustaining. Once this occurs there will be nothing we can do about it. This is what is called the “tipping point.” These are the general views of the main body of bourgeois science. There are, of course, still dissenters or “deniers” as they are generally known. Many “deniers” have been shown to be funded by sections of the bourgeoisie, such as the oil companies, whose profits are under threat from any attempt to limit emissions of GHGs, and their scientific conclusions have been dismissed for this reason. While this alone is not a valid reason to reject the “denier’s” arguments, it does appear that they are now a fringe group who are no longer taken seriously by the main sectors of bourgeois science. Anthropogenic climate change caused by increasing emission of greenhouse gases is now the accepted explanation of global warming. Empirical measurements show massive increases in the amounts of GHGs in the earth’s atmosphere and a relentless rise in temperature. The melting of polar ice and glaciers, the warming of the seas and rises in sea levels, which result from this warming, are daily reported in the bourgeois press. It is therefore the case that, if the science of the IPCC is correct, we are on the road towards ecological catastrophe. In the last 50 years the world economy has grown by a factor of 5. This massive expansion of production has produced degradation of the eco-systems of the planet on a scale never before witnessed in mankind’s existence. Humanity’s ecological footprint now exceeds the planet’s capacity by 30% (4). Climate change, which is a disruption of the carbon cycle, is only one of the ecological degradations taking place. 60% of the world’s ecosystems are now degraded. For example 20% of the world’s coral reefs and 35% of its mangrove swamps have been destroyed. The Millennium Ecosystem Assessment concluded that out of the 24 natural processes on which our survival depends, 15 are in decline or are becoming unsustainable. Key processes under threat are, provision of water via the water cycle, provision of food and of timber, regulation of climate, pollination of all types including crops, soil formation, photosynthesis and nutrient recycling (5). During the 50 years from 1960 to today, the concentration of CO2 in the earth’s atmosphere has risen from 315 parts per million (ppm) to 387 ppm, an increase of 23%. The steady increase in actual emissions of CO2 is shown in the graph below. As can be seen actual emissions per year, determined by two separate scientific bodies, are now approximately 7.8 Giga (109) tonnes or 25% greater than they were in 1990. It can be seen also that they are increasing faster than the most pessimistic projections made by the IPCC which are also shown on the graph. When one recalls that the Kyoto treaty was supposed to reduce emissions to 5% below 1990 levels, one can understand what a complete failure it has been! With the present rates of global growth and population increase the UN estimates energy demand will increase 1.5% annually and that, by 2050, GHG emissions will be 80% higher than they are today. This would produce a 6oC rise in temperature (6) and take the planet well beyond the “tipping point.” This is the background for ever more desperate solutions being put forward by the left wing of capitalism. 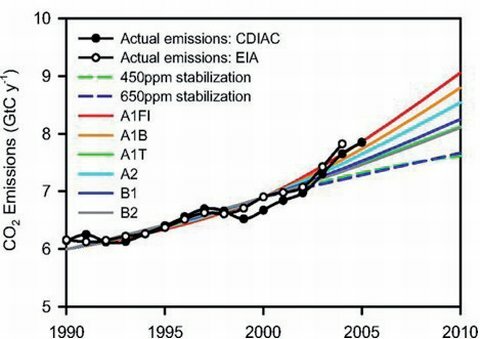 A1F1 - B2 = Assumptions of IPCC 4th assessment paper. Worst scenario A1F1 was that the world energy continued to be based on fossil fuels. Actual emissions are worse than worst case scenario. The failure of capitalism to address these issues is, in some sense, leading people in the green movement to the conclusion that capitalism cannot solve these problems since the problems are located in the system of production itself, that is to say, they are systemic problems. Although they are led towards such a conclusion by what they see in front of their eyes, they never reach it. Even those who claim the title anti-capitalist remain fundamentally committed to the capitalist system. Despite all the evidence to the contrary, they still think it can be goaded into a dramatic measures to reduce emissions. Decouple the economy from carbon. Enforce individual carbon quotas on everyone. Move to a zero growth or even a negative growth economy. Some commentators even propose putting countries on a war footing, i.e. suspending the laws which govern the capitalist system, as the only way of achieving these ends in the time left! The proposals, which betray a sense of desperation, are worth examining briefly before we turn to the real problems which vitiate any solution within capitalism. 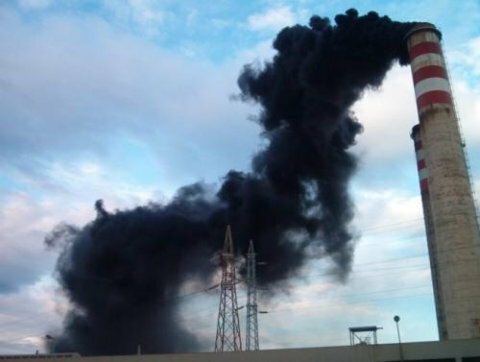 The idea behind this scheme is to break the link between carbon and the economy and was actually what the Bush administration was advocating as an alternative to emissions control via the Kyoto agreement. At present our economies depend mainly on oil, coal and gas for their energy. Growth in the global economy demands increases in energy from these sources, hence more greenhouse gas emissions. Growth is therefore directly related to increases in carbon emissions. If, advocates of this solution argue, we could produce energy from a non-carbon source, for example by nuclear fusion, we could stop burning oil, coal and gas and live happily ever after. Such a tremendous scientific breakthrough is, however, highly unlikely and it is for this reason that this scheme is often called the “magic bullet.” However, such extreme innovations are not necessarily needed. If we could simply reduce the amount of carbon which we consume to produce each unit of output, emissions could be reduced. In fact the global economy has been reducing its consumption of carbon per unit of output quite dramatically. Table 1, opposite, shows that the more advanced countries are far more carbon efficient in producing products than the developing countries. Japan, for example, uses a quarter of the carbon for producing each $1 million of GDP than the African Union. Overall, in the 30 years from 1980 to the present, the amount of CO2 emitted per unit of output has been reduced by 25%. However, in the same period CO2 emissions have gone up 50%! This is because the economy has grown at a rate that more than compensated for the efficiencies achieved. The prospect of finding an alternative energy source which could eliminate our reliance on carbon in the next few decades is clearly utopian. A gradual decoupling from carbon is something being attempted worldwide but capitalism’s continual need for growth simply undermines its effectiveness as a solution to the problems we face. Cap and trade is an attempt to use market mechanisms to reduce emissions. Emissions trading originated in the Kyoto protocol but similar schemes have been operated in the past. The most well known was the sulphur dioxide emissions trading scheme operated in the US to reduce acid rain. An EU emissions trading scheme, which is the biggest in the world, has operated since 2005. A proposal is now being made to extend the scheme to individuals. This is actually being taken seriously by the UK government and the Department for Food Environment and Rural Affairs (DEFRA), published a “Rough Guide to Individual Carbon Trading” in 2006 (7). In November this year, Lord Smith head of the UK Environment Agency put forward such a proposal as part of the new “green deal” (8). Everyone should, he said, be issued with carbon credits which could be traded and operate like an alternative currency. Everyone would have a carbon credit bank account and any product contributing to a person’s carbon footprint, e.g. travel, electricity, water, food etc. would have to be bought with these carbon credits. Before considering this in further detail it is worth reviewing how the cap and trade scheme for industry has worked. Under the EU scheme any company using or producing more than 10 megawatts (MW) of energy has to register and be allocated a cap on emissions and carbon credits up to that cap. Approximately 10,000 industries in the EU are now registered under the scheme, but at present, this only appears to account for half the CO2 emitted in the EU. Carbon caps and credits are issued by the state, e.g. 1 tonne of CO2 would equal 1 credit. Carbon credits, are awarded free of charge on past emissions records so the biggest polluters receive the most credits. If polluters exceed credits they can buy permits from companies who have not used up theirs, or they can offset their emissions by schemes to reduce atmospheric CO2 anywhere in the world. There is, of course, a market in these credits which mirrors other modern capitalist markets with the usual brokers and trade in futures, derivatives, options etc. The problem with this scheme is it is controlled by the capitalist state which is the representative of the major polluters and the initial credits awarded appear to have been far too high. Reporting of emissions relies on the polluters and is difficult to monitor. The biggest polluters, who get the biggest carbon credits, are generally in a position to continue polluting by buying allocations from others. So far the scheme has not contributed to any real reduction in emissions and appears riddled with chicanery. However, when the present trading period ends in 2012, we are assured that the caps will be reduced and the scheme will become more effective. Perhaps the most scandalous aspect of the emissions trading scheme is the offset trade. This has been described as the modern day equivalent of papal indulgences. It is estimated that offsets could deliver half of the EU’s cuts in emissions pledged by 2020! An example of the offset trade which illustrates how the trade is shot through with trickery and often creates more environmental degradation than simply continuing to pollute, is that of Grangemouth refinery in Scotland. The refinery flares off greenhouse gases day and night but instead of stopping this pollution, BP, which was at the time the owner of Grangemouth, offset the pollution by investing in the establishment of eucalyptus plantations in Brazil. These trees, which are indigenous to Australia not South America, lowered the local water table and this, together with the pesticides and herbicides used for their cultivation, destroyed local agriculture and livelihoods, and made villages, which had been lived in for generations, uninhabitable. This forced locals to move out of the area and so joining Brazil’s landless population, which in turn is leading to the clearing of the rain forest to produce arable land thus decreasing CO2 absorption. The net decrease in CO2 is highly questionable. Even so BP went on to claim that, since the trees would in future be used for making charcoal, the savings from the coal which would, hypothetically, they argued, have been used in the Brazilian steel industry must be added to their offset credits! Thus an environmentally damaging scheme with questionable carbon saving in one part of the world is used as justification for the continued emissions of GHGs in another part. This example is not atypical of the chicanery perpetrated in the offset trade. (9) The emissions trading could become more effective if the states involved really wanted to reduce emissions, however, the key issue is not the mechanics of the scheme but profitability of capital. If such a scheme starts to threaten the profitability of EU capital or its ability to compete with other states it will be circumvented in one way or another. The individual cap and trade scheme does appear to be different. It appears to be a means of limiting consumption. The DEFRA, report, referred to above, says it could force individuals to consume less and the cap could be screwed down regularly. It is obvious such a scheme will be used as a means of reducing consumption of the working class under the halo of green living. The left have for many years presented the issue of climate change as one of personal responsibility and an issue of lifestyle politics, sanctifying local production, vegetarianism, recycling and so forth. Cheap commodities such as clothes, electrical appliances, food, which the globalisation of capitalism have made available, should, so the argument went, be rejected on moral grounds as they had hidden carbon content. It is ironic that these ideas are now being taken up by the bourgeois state as a means of restricting working class consumption. A further irony is that the market, which was supposed to regulate everything on the basis of price, is now to be undermined by government regulation! A type of parallel currency would be introduced. However the system works, it is clear that once consumption is reduced, wages can be reduced and UK capitalism can, in turn, increase its profitability. Zero Growth - Negative Growth? Many in the green movement understand that continual growth means continual increase in CO2 emissions and hence advocate a zero growth economy or an economy which is shrinks. This idea shows a fundamental misunderstanding of the way capitalism works and, of course, it had not been taken up by any bourgeois organisation. The recent G20 finance ministers meeting held in Scotland in November, called for “sustainable” growth and “balanced” growth in its communiqué. Capitalism is a system which exploits unpaid labour from the working class. Part of this surplus labour can only be realised by accumulating capital which means expanding the forces of production. For this reason alone capitalism needs to have continual growth. Capitalism generates a tendency for profit rates to decline over the long term. This can be countered by increasing productivity and increasing the volume of production. Competition is continually driving this process and it results in a need for continual growth. The “zero growth” or “negative growth” economy is therefore simply an illusion completely unrealisable under capitalism. The reasons why capitalism cannot solve the environmental crisis are located in the nature of capitalist production itself, namely its need for continual growth. As long as capitalism exists as the global system of production it can never be in equilibrium with nature and degradation of the planet will result. The problems of climate change can only be solved within a more developed system of production namely, communism (10). The choice facing the world on the environmental front as on the social front is one of the ruin of civilisation or the construction of a communist world. (3) Water vapour is a more important greenhouse gas than any of the other gases mentioned and has kept the atmosphere warm from the earliest geological periods to the present. However, since this is not an anthropogenic gas and is generally in clouds which reflect radiation out of the earth’s atmosphere it is not considered as important as the other gases. (4) Quoted in Water and Environment Management magazine, WEM Vol. 14, No 8 Pg 26. (5) See Millennium Ecosystem Assessment (UN 2005). (6) IEA figure quoted Guardian 11/11/09. (9) The Dutch Electricity Generating Board used a similar scheme in Uganda to compensate for building new coal fired power stations in Holland. Again local people were deprived of their livelihoods and forced off the land. (10) Communism has nothing whatsoever to do with the systems which existed in Russia and China. These systems were not communist at all but a variety of capitalism which we call state capitalism.